After yesterday's rain, I woke up to a gloriously sunny and warm day, Ganesh be praised. 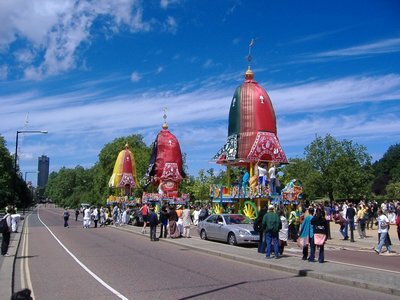 For while it was raining on the Formula one drivers in France and the hikers in Scotland (though, of course as he have already discussed, they are probably loving that), it was sunny here in London for the 40th version of the Rath Yatra parade. The parade in London runs from Hyde Park to Trafalgar Square, and has been a fixture in London since 1969. I was surprised by the number of white people there dressed up to celebrate the Hindu gods, but then I remembered that the UK has a long connection with India, back to the days of the Raj, through to when the Beatles travelled to India and learned to play the sitar, and finally today when there is a large population of Hindu immigrants from India living, mixing, marrying and having babies with the white population. It should be no surprise then that some of the local (previously Christian) population has moved allegiances to the Hindu gods. Here is a video that I put together of the day. It's my first attempt at video editing using iMovie. The audio isn't quite what I wanted it to be, but it'll have to do. Please enjoy. A Youtube user named CopyCutNPaste put together a montage of a number of different videos of the Rathayatra parade, including some shots from mine (with my permission, of course). He calls me a devotee in the credits, which I am not, just an interested observer. Anyway, if you want to check it out, there is about 10 minutes of footage there, only about 20 seconds or so of mine, so it's MOSTLY NEW CONTENT! (For those who are focused on me, like I am, my clips run from 4:58 to 5:35 (or so)). Follow this link to Youtube to see the video of the 40th Rathayatra celebration in London.